Compost is a great way to add organic matter to your soil. Almost all soils will benefit from a bit more organic matter: it helps to break up heavy, clay soils, and to improve the water retention of sandy soils, as well as providing more nutrients. Of course you can buy compost, from compost suppliers. Mushroom compost, and mushroom and manure compost are particularly good options. But why not make your own compost from kitchen and garden waste? It’s really not that hard. So what do you need to start composting? You can make your own compost bin, perhaps from old pallets, lined around the sides with old carpet or black plastic (click here for more info on this). But if you don’t fancy that, then you can buy one instead. Choose from basic wooden bins, cute wooden beehive-shaped composters, or more practical plastic ones. Some councils even provide subsidised composters so check out your local council’s website for details. Although not absolutely necessary, it’s helpful to have two bins: one to fill, and one to be ‘maturing’ at any one time. 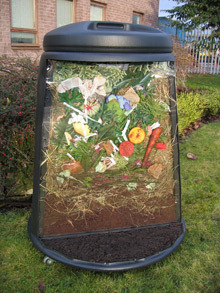 Site your composter in an unobtrusive spot, as they are not beautiful, and you probably don’t want to be looking at it from your patio! It’s best to put it onto soil, if possible, as this gives the worms easy access. However, if you don’t have any soil-covered space, then put it on concrete, and add worms once you have a reasonable amount of waste already in it. What can you include in your compost bin? Well, almost any green waste from the garden, raw vegetables and fruit, tea bags and leaves, and coffee grounds. Some authorities advise you not to compost any cooked vegetables, although many people include those without any problem. You can also add cardboard and shredded paper, though not too much of it, as it improves the texture. You should, however, avoid any meat or dairy products, as a small domestic compost heap won’t get hot enough to destroy the bacteria in those, and you may also attract rats. It’s also advisable to avoid woody waste, as this won’t rot, and you will end up with compost full of sticks. Read more on on what you can compost at home. Most councils offers a garden waste collection, or an option to take this type of waste to the municipal tip instead. It’s also best not to try to compost autumn leaves, as they take too long to rot. Instead put them into a black bag, dampened, and make leaf mould instead. Let the worms take up residence in your compost bin, and sit back and wait for your kitchen waste to turn into lovely nutritious compost! Making your own compost is a great way to use your food waste, and feed your garden at the same time. It’s a win-win situation!